The system is operational and was adopted by several armies, led by the IDF, as a solution for infantry forces. This may be the first step taken by the Infantry Force to integrate with the modern battlefield’s C4I system. 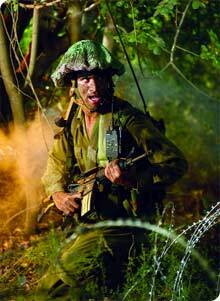 Elbit Systems manufactures C4I systems for Infantry as part of a comprehensive concept of more efficient, flexible and versatile infantry units in executing their missions. Every squad and platoon commander in the infantry is familiar with the feeling of patrolling in alleys whether in a village or a city, where they face difficulties such as encountering the enemy at short range and without warning as well as all the command and control problems inherent to the environment. The infantry soldier is the most flexible and versatile element in the combined arms battlefield. To fulfill his mission, he needs to be proficient in many competencies and skills suitable to a broad variety of global situations and mission types. He is required to be aware of his commander’s intent and to be able to command his own troops, while conducting a myriad of complex missions that require him to employ platoon weaponry, manage, make decisions in various situations, while under fog-of-war conditions. All of this must be done while showing superior persistence, leadership skills and spirit of combat. Difficulty in generating common language and difficulty in transferring information at all mission stages and at all levels. Difficulty in controlling the forces, especially in dynamic situations. Detection, recognition, identification and situational awareness of threats and targets. Weight carried by infantry soldier limits the forces’ mobility and fighting ability. Short endurance, due to limits in the carried load. Low survivability – Infantry soldiers are vulnerable to many and various threats. Limited decisive and flexible firepower. The solution was the Dominator®. The system provides answers to most of the aforementioned gaps by means of a comprehensive and advanced combat doctrine for the Infantry Forces. The programme covers many infantry activity areas, from individual to the formation. Globally, many activities are implemented to modernise the infantry. The IDF’s Future Infantry Program (called the ANOG program), which began several years ago, includes the Dominator programme (the other components are capabilities for AT, reconnaissance, mortars and sniper platoons). The purpose of the programme is to significantly increase the operational efficiency of the infantry combat formation through a broad arc of missions, in changing climates and various terrain conditions. Geared for the unit level and individual soldier, the Dominator® enables forces to dominate the field by giving infantry units with full situational awareness through networking into an integrated information systems. Outfitted with the “Dominator®”, soldiers can send and receive information in a real time Common Operational Picture (situational awareness of enemy and own forces) on personal displays, as well as live video from either external or on body sensors and transmit images and positions back to the CP and colleagues. The system helps prevent unnecessary casualties, including friendly-fire mishaps. The Dominator® incorporates Elbit Systems’ C4I software solutions for the infantry user (C4I SW), based on a C4I infrastructure optimised for tactical forces. C4I SW was developed specifically to assure simple, swift operation in the most intense combat scenarios. It supports planning, situational awareness, targets handling, devices connectivity as well as video and map displays. It also provides command and control functionalities for all levels of commands of the light infantry forces along with interfaces to armoured units, artillery and close air support. Elbit Systems communication systems provide optimal, uninterrupted information flow, ensuring voice and data arrive at the right time and right destination. The Dominator® interfaces and operates with all existing communication equipment. TIGER® – (Tactical Intranet Geographic Dissemination in Real time) system. The PDU interfaces with all the peripheral elements and as an option a PCMCIA Advanced Tactical Modem can be attached to the PDU to enhance existing radio’s performance. TIGER® enhances real time decision making at all force levels by unifying all channels, integrating them into one dynamic tactical intranet, and creating interest-based, geographic data dissemination. TIGER® provides the relevant information at the right time and provides optimum message transfer, flow and continuous delivery. The generic, modular and scalable system can be customised to every operational demand. Eyepiece – This is a high quality display for the C4I picture and live video and built-in LOS (Line Of Sight) sensors. The eyepiece may be mounted on a helmet, on the warrior’s vest or as part of the weapon-mounted Fire Control System. Weapon-mounted Fire Control System – “automating” the interface of the weapons and sensors, fast & accurate target acquisition and engagement with special ammunition (40mm air burst, ballistic data calculation and aiming capabilities), shortening the sensor to shooter loop as well as improving sniping capabilities. Hand-held Display – A compact portable display, sunlight readable, 5.6” or 8” touch panel screen and operation function keys. This display is designed to display the C2 application and streaming video. This display was mainly designed for commanders’ needs of mission planning, mission receipt and transmission from commanding to subordinate levels. This display will be used when conducting planning and out of contact with the enemy. During battle management (while in combat) the Eyepiece will be used. CORAL – CR- a hand-held lightweight thermal imaging target acquisition system, including laser rangefinder, compass and GPS. Power Pack – Equipped with status indicator. The battery level is constantly reported to the operator. Radio – A Handheld Multi-Band 30-512MHz radio using a Unique ECCM/COMSEC capability and synchronous-orthogonal frequency hopping. The radio also uses dynamic network synchronisation thus eliminates need for a central control station, and an advanced digital encryption for high level voice and data security (COMSEC). Squad-Level Software-based Radio – This is capable of Full-Duplex (3-6 simultaneous speakers), 3-way conferencing, and an unlimited number of listeners. 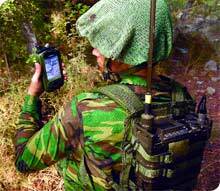 It supports Digital Voice & Data, Communication over ranges from range 1500m in open terrain to 350m in Urban. It has full AES Encrypted, Sub-Networks capability, and 400MHz frequency and is thus optimal for urban and jungle scenarios. There is no synchronising station. Skylark® Mini UAV – A compact, man-packed UAV for very close range, beyond-the-hill reconnaissance missions. Designed as an excellent solution for smaller forces, the Skylark® is especially effective for yielding real-time intelligence at a relatively low cost. VIPeR® – A small stair-climbing robot for “in-building” reconnaissance and improved next step awareness, and improving the effectiveness and survivability of the breaching force. Many of these systems are currently deployed in combat zones worldwide. Lethality: The offered system provides the soldier with a weapon which has greater accuracy and enhanced target acquisition capabilities. Lethality improvement makes a direct contribution of the command and control systems improvement. The information received by the soldier, thanks to the various systems, (radio, display, eyepiece, etc.) allows him to be totally focused on the missions’ goals. Though generating information from other subsystems assists in missions, it can never replace the sensors on the soldier himself. The offered systems increase the range of targets handled by the soldier and infantry’s combat formation. Command, Control and Communication: Command and control improvement means full control by the commander and a full situational picture during combat. Command and control improvement means lightweight, reliable, secured and low energy consumption communication equipment. The offered system allows command and control continuity over forces during AFV travel and maneuvering by foot after dismounting AFV. The systems have the capabilities to conduct automatic reports, advanced navigation even without GPS capabilities, position identification, and automatic information management. Survivability: The offered system significantly enhances the intelligence picture. The ballistic shielding system provides soldier with advanced protection against shrapnel and other battle threats and provides camouflage using advanced means for all terrain and field features. Mobility: Soldier’s current capability to move by foot and fight depends on the load he has to carry. The offered solution emphasizes development of lightweight systems allowing the soldier to perform his missions with maximal flexibility and mobility. Referring to the combat formation as an answer for weight division constitutes another tier for the solution. Dominator® system connection to quick and protected mobility means, such as light vehicles, and AFVs, while maintaining C&C continuity even after dismounting the AFV. Endurance: The offered solution should be self-customizing to all the battlefields’ various operational requirements.